This week I shall highlight some kid friendly lunch box ideas. When I run out of ideas, my kids are a great source of ideas. In this digital age, kids are so aware of possibilities and ideas mostly gathered from social media. So inspiration for this recipe is my little one. I asked her what she new thing she would like to see in her lunch box and she suddenly jumped up and said if I could make Zoodles. I told her that we were yet to invest in the Spiralizer but I could make them as ribbons. She loved the idea and was willing to give it a shot. My older one was a little skeptical as she doesn't like to experiment in her lunch box. She would first try it at home. If she likes, then the recipe is approved for lunch box. But thanks to the tons of recipes on her social media feed, she grudgingly agreed to experiment this for her lunch box. I just seasoned based on what my kids like. Please feel free to play around with seasonings for a variation. I found making ribbons was very easy. It took me about 5 minutes for the 2 medium zucchini I used. For ease of use I sliced them into half vertically. Sprinkle some salt and leave it in a colander for a few minutes. In a heated pan, add oil and saute grated garlic until translucent. Sprinkle lime zest, pepper, lime juice and add the zucchini ribbons. Add the drained spaghetti, toss them well and let them absorb the flavors for a minute and remove from heat. In a serving plate, arrange the spaghetti along with the zucchini ribbons, top it with the pasta sauce and grate some cheese. Serve warm. Sending this to Srivalli's Kid's Delight event, guest hosted by Bhawana themed on Lunch Box Dishes In 30 Minutes. I am glad your experiment with the ribbons worked out. Nice recipe for a lunch box. What a fantastic idea ! Zucchini ribbons must have tasted awesome , must try this . Btw I have a spiralizer so let me try with that ! I have made zucchini noodles and loved it so kuch. This dish paired up with spaghetti looks fantastic Harini. 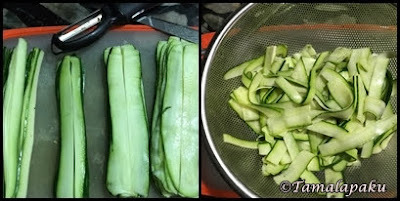 Those zucchini noodles looks incredible and one of the fabulous way to enjoy zucchini. Love the crunchiness. I am still yet to wrap my head over the fact that kids give us so many options themselves..these ribbons look fantastic, very nicely done! Wow, such a healthy and low carb pasta. Kids these days amaze us each and every moment. I agree with your kid about not experimenting on a recipe for lunch box. This looks so delicious! ribbons are a great alternative when you don't have a spiralizer and what a healthy lunch!